Ask fellow campers about "Yogi Bear's Jellystone Park at Birchwood Acres" and nearby attractions. We had a wonderful stay! The park is clean, the activities for kids are entertaining, and our RV site was spacious. We didn't feel cramped like other parks. The staff really does make an effort to entertain the kids and be engaging. We are looking forward to going back again! We camped at Yogi Bear's Jellystone Park at Birchwood Acres in a Travel Trailer. Not much to do or see beyond the park gates. 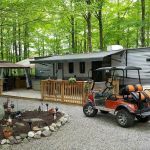 Thank you DEFT_OUTDOORSMAN for letting us know about your stay at Jellystone Birchwood Acres. 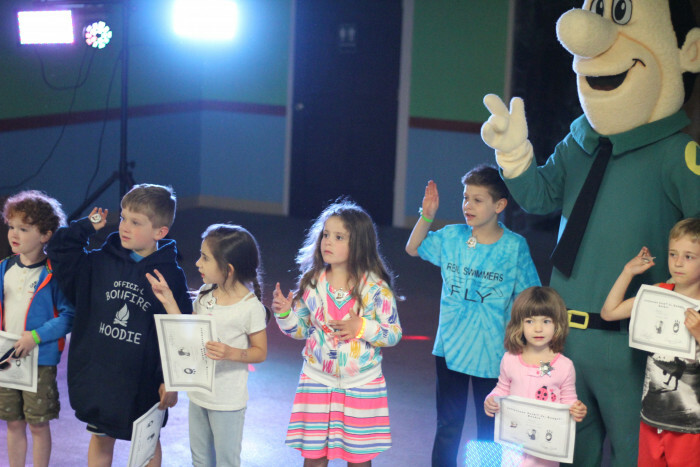 We are so happy your kids had a great time with Yogi and Friends. We look forward to seeing you around the campfire again soon! An excellent family park, now owned by Sun RV Resorts. The sites are on several hills, with rustic cabins and lodges throughout the upper end of the park. 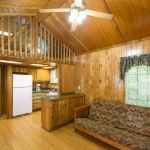 Excellent tenting facilities, with a covered pavilion, recreation hall, water park, a fishing pond, snack bar, well-stocked ranger station and golf cart rentals. (No transient guests may bring in their own, and motorcycles are not permitted inside the park beyond the ranger station). Friendly staff and visits by Yogi, Cindy and Boo Boo bears. We camped at Yogi Bear's Jellystone Park at Birchwood Acres in a Fifth Wheel. for our 4 day visit to see friends in the area. We camped at Yogi Bear's Jellystone Park at Birchwood Acres in a Motorhome. Great family campground, the grounds are clean, staff is very friendly from the guy checking parking passes to the guy cleaning up sites. The splash pool is great for little ones. The sites are level but could use more gravel as it rained on us and we had a lot of mud. The playgrounds are great and the kids love the fire truck rides. Fishing is awsome, the lake is well stocked and all you need is some bread and small hooks (we used left over pancakes). There is always something to do, if you get bored its your own fault. The ranger station is at the bottom of a big hill which can be troublesome, but it is well stocked and priced fair. We have been here 2 times a year for 6 years. To show how dedicated the staff is to their "guest" (I say that b\c you feel like one, not like a customer) last year there was a power outage and they gave everybody a free night voucher. If you live in NYC or Long Island I would go to this one, or Gardiner. We camped at Yogi Bear's Jellystone Park at Birchwood Acres in a Travel Trailer. We camp here several time a year. This is is still a family owned campground that is super well maintained. Everything is clean and spotless. The pool is spectacular!! We will keep coming back. We camped at Yogi Bear's Jellystone Park at Birchwood Acres in a Travel Trailer. Our site was clean, spacious and shaded. We were on top of a steep hill, and the pool and the store was at the bottom of this hill. That was a detriment, especially in the heat. Other than that, it was a great campground. We love the candy bar bingo and the staff was so involved with all of us! We camped at Yogi Bear's Jellystone Park at Birchwood Acres in a Motorhome. We stayed here 5 times over the past 2 years and have always been extremely happy. Staff do a great job and the maintenance is excellent and if you have children there are plenty of activities for all ages. Great wadding pool for the little ones as well as a nice large pool for the swimmers. There snack food prices are very reasonable(great soft ice cream)I highly recommend Birchwood Acres even if your going without the kids. We camped at Yogi Bear's Jellystone Park at Birchwood Acres in a Fifth Wheel. We just returned from our 3rd trip to Birchwood Acres and it remains our favorite!! The staff is very friendly, the nonstop activities were a hit with the kids. The grounds and bathhouses are clean and well maintained. I recommend this place to anyone with children. We will definitely be back! We camped at Yogi Bear's Jellystone Park at Birchwood Acres in a Tent Trailer. We did not camp here, just drove through park. Seemed to be a nice place but the rates are just too high for what you get. (We did not stay here.) We camped at Yogi Bear's Jellystone Park at Birchwood Acres in a Motorhome. It's a nice park if you want to go go go all the time doing activities, our son is only 2 so he couldn't do many of them. There is lots to do. The Down side is the large number of seasonal and fulltimers campers. They seem to have the run of the park. Their sites are mini homes with decks gazebo's, and depending on your taste somewhat gaudy. The parks proximity to NYC/NJ means you get the feeling your staying in one of the 5 boroughs. We never got a car tag when we checked in and the next day when I drove my son up the "hill" to the playground the security guard hollered at me and told me I couldn't go any further without a tag. The sites were filled with pea gravel so they drained well and were fairly level. If you wanted to go somewhere with stuff to do all day and don't mind crowds this would be an ok place, just not for us. We wouldn't go back. We camped at Yogi Bear's Jellystone Park at Birchwood Acres in a Travel Trailer. We love this campground. We came here for the first time last year for a weekend. This year we came back for 4 nights. There is TONS to do for all ages. There is no way anyone could be bored here. There are constant activities, but no pressure to join if you don’t want to. 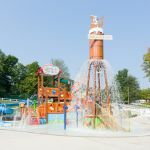 Of course the spray pool was a HUGE hit as were the fire truck rides, large playground, campsite visits from Yogi/Cindy Bear/Boo Boo and the crafts and activities. The wifi worked up top but was very slow. Staff was all very helpful and friendly. All the seasonal sites are nicely landscaped and well maintained (one of my pet peeves is campgrounds that have seasonal sites that look like junkyards). Not the case here! The owner was very generous and helpful to another member in our party who reserved a site, partially paid for it and couldn’t get their RV running. The only drawback was the bugs/mosquitoes which were VERY BAD up top, in the back. We camped here with 2 adults and 2 children (3 and 6 YO). We camped at Yogi Bear's Jellystone Park at Birchwood Acres in a Travel Trailer. Clean park, nice sites. The hill down to everything is a killer for kids and bikes: had three accidents while I was watching, just on the hill. The security guard is a grouch as well as the night time guys. There are A LOT of rules. We put our fire out, we were a group relaxing and enjoying our night talking with citronella candle, because the bugs were bad. The night guy and his posse of 2 others came over with a bucket ready to put out our candle. Heavens its not a fire! Then proceeds to throw, yes throw, a copy of the rule sheet in my lap. He said to us, "You signed it, don't make me have to start asking you to leave." WOW what did I say? It was like this the whole weekend. Heaven forbid you toe the line or look at some of the staff funny. We watched a woman walk by the hot tub with her baby to talk to her husband who was in it. She had a cover-up on, and the life guard was on her like white on rice within seconds about the kid can't be in there. I doubt we will return, it wasn't relaxing with all the staff on you like a hawk. We camped at Yogi Bear's Jellystone Park at Birchwood Acres in a Fifth Wheel. There are alot of positive aspects for this campground: very clean restrooms/showers, crystal clear pool water, clean & tidy surroundings, alot of sport amenities, well stocked camp store, excellent snack cafe, alot of daily children activities, game room with air hockey/pool table/ping-pong table (rarely see all 3), modern playground equipment, excellent rental lodges/cabins, & a very helpful,courteous staff. However, there are 2 reasons why I can't give a 10 rating. First the HILL. The entire campground is a hill, and all the amenities are at the bottom. So everyone drives their cars to get to the pool, store, etc...There is a town road, which separates the campground by the pool, and the locals drive beyond the speed limit on it. Second, the RV sites lacked gravel. The rental RV sites had gravel, but the rest were grass/dirt. It rained for 1 day during my stay, and I spent the next day battling mud. Despite those 2 exceptions, it is a wonderful park & I will return. We camped at Yogi Bear's Jellystone Park at Birchwood Acres in a Travel Trailer. Nice campground-well kept. Many seasonals and the kids of the seasonals think they own the place. They are running amok and sometimes inconsiderate. The pool and splash pool were great. The main entrance is located directly on a main road and residents drive down the road at unbelievable rates of speed. Good activities for the kids but would not return. We camped at Yogi Bear's Jellystone Park at Birchwood Acres in a Travel Trailer. We just returned from our second week-long stay at this campground and will definitely be back. The camper sites are nice sized, grass and mostly shaded. There is a large pool with clean bathhouses and a spray pool for kids. There are nonstop organized activities for kids everyday of the week in the summer which I find to be rare. My kids loved the daily hay ride or fire truck ride with the characters. This place is very clean and their countless staff members are always very friendly. The only negative is the pool and fishing pond are on a public road and although it is posted at 25 mph there were people driving much faster than that which makes anyone with kids nervous. We camped at Yogi Bear's Jellystone Park at Birchwood Acres in a Travel Trailer. 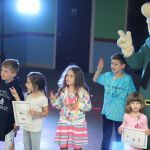 Are you affiliated with Yogi Bear's Jellystone Park at Birchwood Acres ?